Submitted by Taps Coogan on the 7th of April 2019 to The Sounding Line. As the following chart from The Atlas details, the average American lifespan has been falling since 2014. 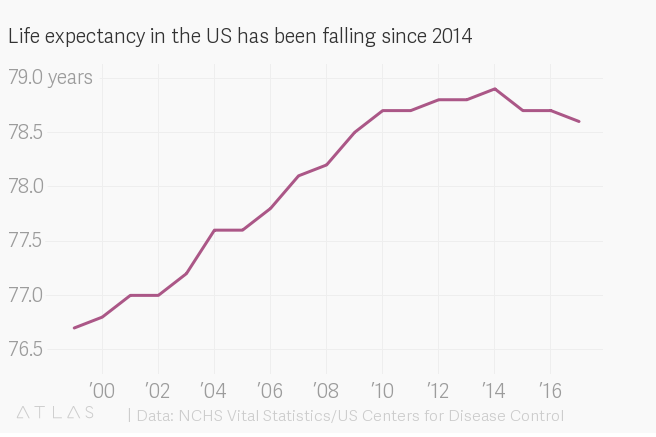 It is the most significant such decline since the Spanish Flu stuck after World War I. As we have discussed before, the explosive rise in drug overdose deaths in the US is the primary cause of the decline in life expectancy, though rising suicide and obesity rates are contributing as well. Just add it to the list of deep contradictions in what is soon to be America’s longest, and most flawed, economic expansion. Map: Whether Every Country Imports More from China, the EU, or the US → ← Who Wants ‘Soft’ Brexit?